Gina found this recipe somewhere online, a very simple cookie to make. Makes a rich, delicate butter cookie. 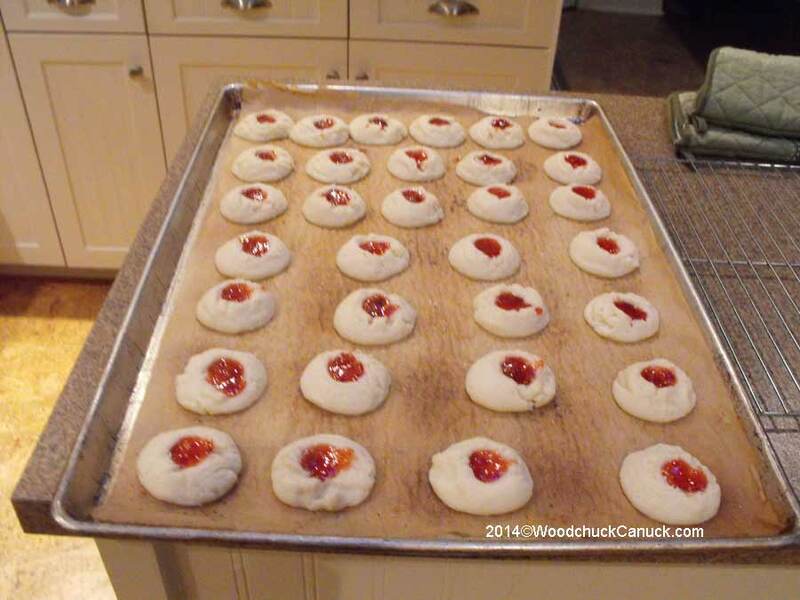 Walnut size dough pieces on pan, make small impression in dough, drop in jam. Make sure the dough is covered well otherwise it will crust over in the fridge. Not a major concern, just worthy noting. We used a #16 scoop to make the size. What you see in the picture is what we got from the batch, all onto one pan. At 10 min the cookie still had a shine on the top, meaning it was not baked enough. We went 2 more minutes and took them out. They are just barely done. Next time we will try baking them at 375F for 10 minutes. If you enjoy the buttery mouth texture, these are a very good cookie. Alternate recipes could be a lemon zest or orange zest. You could half dip or drizzle the orange cookies with chocolate. Today we used a simple glaze in a wax piping tube.